That was 2012, the start of Carriage House’s dinner series , which now run from May until, yes, chilly November. On-farm dining — the ultimate expression in farm to table — has been gaining popularity for several years. Diners willing to drive out of the city can leave behind brick and mortar in exchange for a long table in a field of sunflowers, or a terrace view of horses and cattle. And with food mostly grown or raised on the premises, it’s as local as you can get. 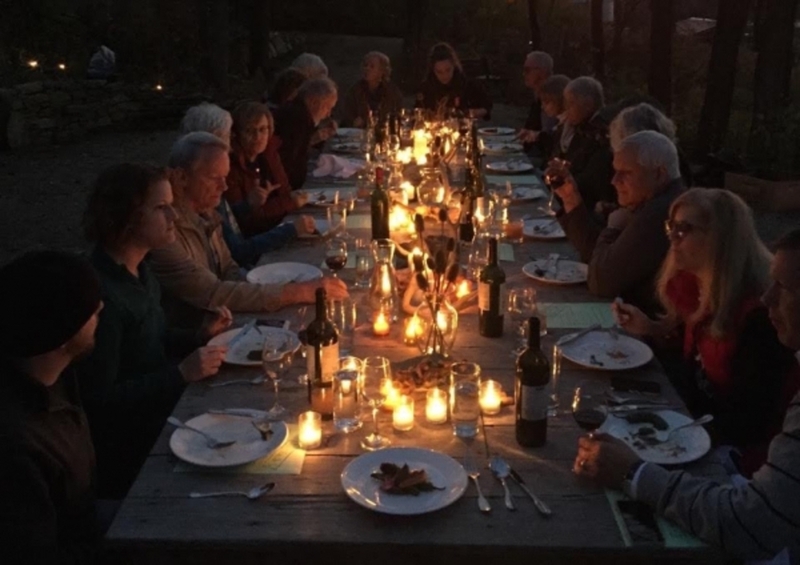 After a walk in the fields, and meal preparation by some of the best chefs in the region, diners at Carriage House Farm enjoy dining at candlelit tables under the stars. Stewart, whose family has owned Carriage House since 1855, gave several reasons — beyond pecuniary — for going all-in, building an outdoor kitchen, bridging the gap from farm to table. It’s also about the chefs and friendships, history, the environment — and fun. Carriage House follows organic growing practices for some, but not all, of its produce. This season Carriage House is starting ambitiously with a foraged dinner based on wild and native plants harvested in the wooded areas of the 300-acre farm — and possibly influenced by Appalachian and Native American cuisines. Wild/native in this case does not necessarily mean random. Many of the edible plants on the menu were originally planted four years ago by botanist Abby Artemisia, who on May 15 will lead diners on a pre-dinner tour of the woods where their morel mushrooms (if available), ramps (if available), spice bush berries, mountain mint, and wild greens, like chickweed and violets, will have come from. Stewart said the meat may be venison, and foraged ingredients will be used in main courses as well as sides. She said she will discuss what is safe to eat and how to cook it as well as the ethics and sustainability of foraging, and some of the botany. Mark Bodenstein, chef for the evening, shares with Artemisia and Stewart an interest in the cuisines of Appalachia and Native American tribes of this region. To what degree May 15’s dinner will hew to Appalachian or Native American styles is undecided, because he hasn’t written the menu. It will be even more so at the season-opener. 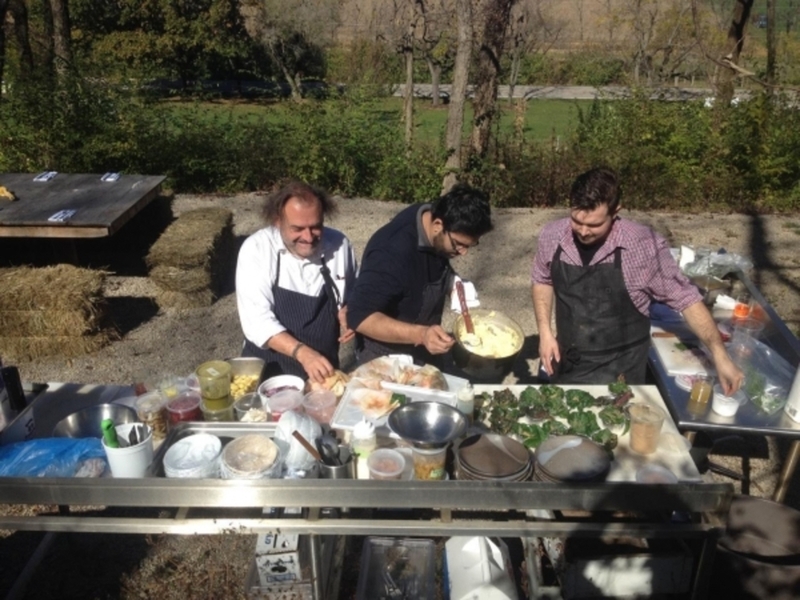 Jean-Robert de Cavel of Jean-Robert's Table helps prepare a benefit lunch at Carriage House Farm in its outdoor kitchen. “All the chefs are different in what they do,” Stewart explained. “Some (chefs), they do a family-style seating, where they drop large platters down and everybody shares. Other people do individual courses that are plated. “It takes time to prep,” Bodenstein explained, “and it takes time also to walk through the woods or walk through the fields and find out what’s available. We show up there half the time at 7, 8 a.m., and by 11 a.m. we finally have a grasp on what’s ready to go.